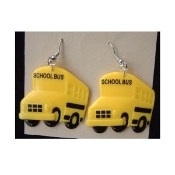 Big Yellow SCHOOL BUS EARRINGS - Driver Gift - Crossing Guard Novelty Costume Jewelry - HUGE plastic charm, approx. 1.5-inch (3.75cm) Diameter. Discover Wildlife. Become a School Bus Driver!